Projects we support. 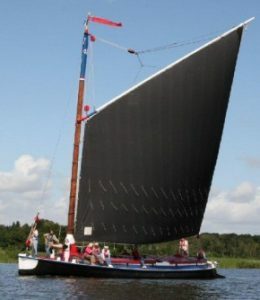 On this page you will find brief descriptions of the projects which have received support from funds from the Love the Broads donations since 2013. Love the Broads is delighted to announce that we have have given over £40,000 of grants to 30 projects over the past 6 years thanks to donations from visitors to the Broads, local residents, tourism businesses and Love the Broads’ Members – thank you all so much. Nearly £10,000 of grants were awarded to 9 projects in 2018 (1 project is still pending). You will find details of these and all other projects below. Applications are now welcome at any time throughout the year. 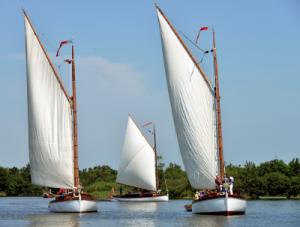 For further details on the types of Love the Broads grants available and guidelines for making an application, please download our Guidance notes for applicants. For an application form, which will enable you to make an application for either our Business Sponsorship or our Small Grants scheme, please download this Application Form. It can be filled in on your computer and sent in to us electronically. For more detailed guidance on how to complete the Application Form and the sorts of information the Trust will need in order to reach a decision on your application, please download our How to complete an Application Form notes. For information about the terms and conditions which are likely to be attached to any of the Love the Broads grants we make, please download this document. For further queries contact us through the link on the “contact us” page. Contribution towards a set of worksheets and education resources, aimed at children, for use by teachers and volunteers delivering education sessions to schools which illuminate the importance of wherries in our cultural history and development of the Broads landscape through commerce and the introduction of tourism. The Broads has lost 67 species since the 1950s and research reveals that 423 rare species, including plants, insects and fish have not been recorded in the last 23 years. Projects such as this are the only way to secure the future of iconic wetland species. This project, which is now completed, has enabled another new Broadland population of this rare and beautiful animal and to share the excitement with an ever growing audience. Exploring nature on the water allows children to experience wetland habitats from a unique perspective by boat on both Hickling and Ranworth Broads, both of which are teeming with wildlife. 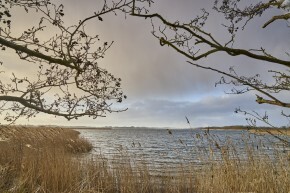 This project will help children of both primary and secondary age connect with this unique landscape in the Broads National Park using new equipment of binoculars and in a safe environment with the help of buoyancy aids. 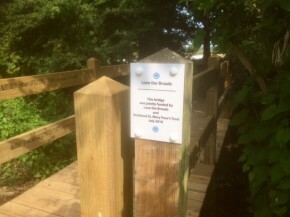 A new footbridge was required to replace the existing one which was not fit for purpose. The bridge connects Rockland St Mary car park, the Staithe and the Wherryman’s Way. The new bridge will enable access for all users including disabled visitors. 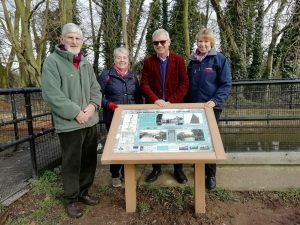 Love the Broads has funded one of six information boards between Coltishall Lock and Aylsham. Each board contains the history of the navigation and local places of interest together with local footpaths and pictures of fauna and flora along the route. The board will be of a similar design to the image to the right. 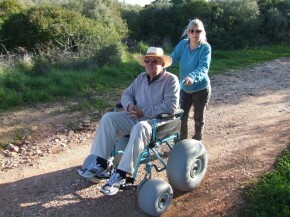 Many visitors to Hall Farm cottages have mobility challenges. 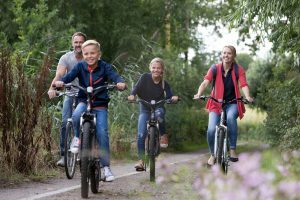 Situated at the heart of the Broads National Park and close to Horning, Hall Farm has access to many paths, communities and to unspoilt beaches. However, normal wheelchairs are not able to access some of these areas due to their terrain. To offer all visitors access to all areas and to ensure an enjoyable experience for the less able as well as their carers, family and friends, an all-terrain wheelchair has been purchased. This will also be hired to other local accommodation providers, when available. 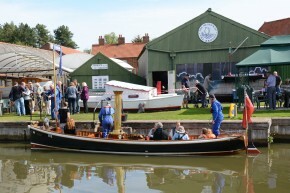 The Wherry Maud has only limited access to mains electricity at her base at Forsythe Wherry Yard and this is often insufficient for using power tools and as a mobile base for educational activities. This portable new generator will enable the attachment of tools and increase its ability to provide educational presentations and visits. 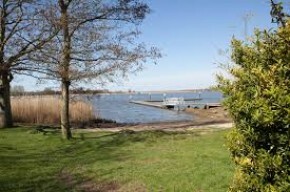 A popular part of a visit to the Museum of the Broads is a boat trip to Barton Broad which is only accessible by water. A new electric boat is to be purchased but to ensure that all boat trips are accessible to all, a wheelchair is essential to benefit from the scissors lift to make boats accessible. This grant will enable the purchase of a wheelchair. There is a need to educate and engage local communities about the environmental issues that affect the Broads’ landscape. The ARSB is a flexible educational tool to explore themes of geography, hydrology, erosion and environment in the Broads and wider catchment. 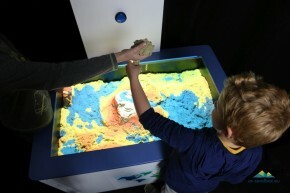 The ARSB is a portable tool which will visit communities and schools and be showcased at special events to raise awareness and understanding of water and how it affects people’s daily lives. There was an identified need to encourage wildlife and to increase biodiversity around the existing pond at Nicholas Everitt Park located at Oulton Broad, a popular leisure and recreational location for both residents and visitors to the Broads. 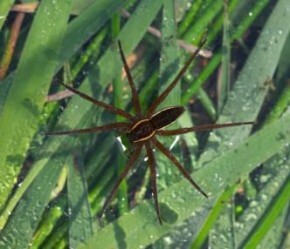 The grant will enable native species to be planted on the bank and margins around the wildlife pond.